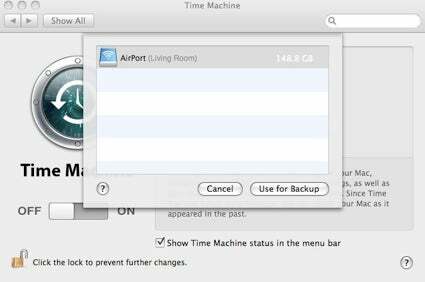 In the aftermath of Wednesday’s release of updates to Apple’s AirPort Extreme wireless base stations and Time Machine on Wednesday, users now have the ability to use disks attached to the AirPort Extreme as a Time Machine-compatible backup drive. When Apple first announced Time Machine for Mac OS X Leopard, the ability to backup to a USB disk connected to an AirPort Extreme was a selling point. However, by the time the operating system shipped, that feature had been removed from Apple’s marketing materials. When the company introduced Time Capsule—a hard drive and 802.11n wireless base station built specifically for Time Machine—in January, many users complained that the feature hadn’t also been added to AirPort Extreme base stations as originally promised. A USB drive attached to an AirPort Extreme appears in Time Machine. Although Apple’s release notes for its Wednesday updates don’t mention adding the ability for Time Machine to back up to a USB drive attached to an AirPort Extreme 802.11n Base Station, numerous users reported that the feature had been added, and Macworld can confirm those reports in our testing on an AirPort Extreme 802.11n Base Station with Gigabit ethernet. Although some users reported that their USB drives worked right away, in our testing we found that the external drive needed to be attached to a Mac and either formatted as Mac OS X Extended (Journaled) or verified and repaired using Apple’s Disk Utility program . After the drive is reset, users should plug the disk back into the base station’s USB port, then mount the disk in the Finder. Once the disk is mounted, users can open the Time Machine Preference Pane and click Choose Disk. The newly formatted USB drive will now be available as a Time Machine backup disk.